At several points throughout our articles we refer to contacting your local swimming pool service engineer. It is important to seek the advice of a reputable pool service engineer when dealing with the safety of your pool – each individual’s circumstances will be slightly different, and our articles may not cover the specifics as they relate to your pool. The advice of a pool service engineer can save you unnecessary costs down the line as they will have a depth of experience, and the professional skills, to give you practical advice based on your own, personal situation. Below is a guide to what you can expect from a good swimming pool service engineer. Most swimming pool service engineers will offer a service where they can provide all of the maintenance for your swimming pool and save you the job of having to do it yourself. Testing of water quality and pH balance. Cleaning out of filtration units (backwashing). Servicing heating, circulation and de-humidifier systems. Repair of lights above and below water level. Ensuring equipment like pool covers, diving boards and slides are in good working order. Keeping stock records for cleaning supplies and spare parts. Attending to immediate water hygiene incidents. We have prepared a separate guide to selecting the right swimming pool supplier which is available here. Building a good relationship with your swimming pool service engineer can pay dividends as they will be best placed to give you advice based on your personal situation, particularly if they have been dealing with you for a while. 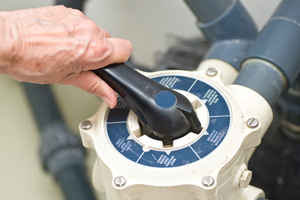 Periodic maintenance of the pool pump, heater & filter, including servicing. Testing your pool’s total alkalinity (TA) and pH levels to ensure that your pool facilities aren’t at risk from corrosion. Testing other levels related to the safe operation of your pool. Advice on equipment which you may need to renew or purchase in order to maintain your pool. You should ensure that your swimming pool engineer carries any relevant qualifications, memberships or accreditation required to perform the work required. You should always ensure that your pool service engineer has relevant insurance cover, to cover you both against anything that might go wrong. To find a local pool service engineer you may find our directory of specialists useful. There are buttons provided to the top right of all pages to access our listings, or contact an engineer. What’s your experience of working with pool service engineers? Have they made your life easier? Did they cut down the time and hassle in keeping your pool running safely and securely? Let us know in the comments box below.